“She was wacky, she was crazy. There was just some strangeness about her. I do remember her being on the tan side. She definitely had some color. 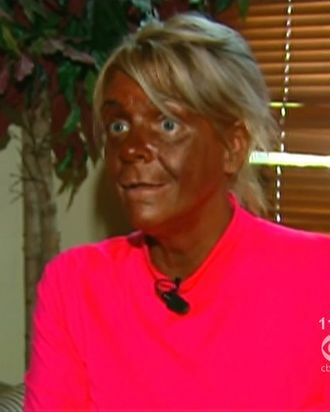 We would go to the beach, but fake-tanning was never a thing.” — Classmate of shockingly (and artificially) tanned New Jersey mother Patricia Krentcil who was arrested recently for allegedly taking her 5-year-old daughter into a tanning salon, resulting in sunburns. In a less measured assessment of Krentcil’s past-and-present activities, said a former clerk who worked a liquor store where Krentcil and her husband would allegedly buy three-gallon jugs of wine two or three times a week: “She is a nutjob."